The word “unique” is often used in travel, and many times incorrectly. We believe that we can now truly offer you, what we believe to be, one of the few “unique” travel products available on the market today. It is our pleasure to be able to offer our clients, unique, private, luxury cruises, which we have collectively called, “To the Ends of the Earth”. We can provide FIT’s and groups of up to twelve clients with the opportunity to sail to virtually anywhere on earth. 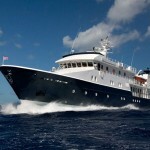 We have some of the world’s foremost experts in polar and world navigation and travel, who will create clients required tours, or unique tours created by them, using either clients own suitable yachts, or known yachts on charter to the experts. "I'd like to thank you and your associates for providing us with a once-in-a-lifetime experience. We were very well looked after from the moment we arrived, to when we returned, and we had a wonderful time." 12, Lancaster Avenue, Sandiacre, Nottingham, NG10 5GW, United Kingdom.